The ultimate goal of Special Olympics is to help persons with intellectual disabilities participate as productive and respected members of society by offering them a fair opportunity to develop and demonstrate their skills and talents through sports training and competition, and by increasing the public's awareness of their needs and capabilities. Special Olympics empowers athletes to become contributing and respected members of society. We support athlete leaders both on and off the playing field. The goal of Athlete Leadership is to empower athletes to develop leadership skills and utilize their voices and abilities to assume meaningful leadership roles, influence change within the Special Olympics movement, and create inclusive communities around the world. Check out our Athlete Leadership One Page Snapshot. If you are interested in submitting a story for SOAR, here are the deadlines for each edition: March 31st (Winter), August 31st (Summer) and December 31st (End of Year). 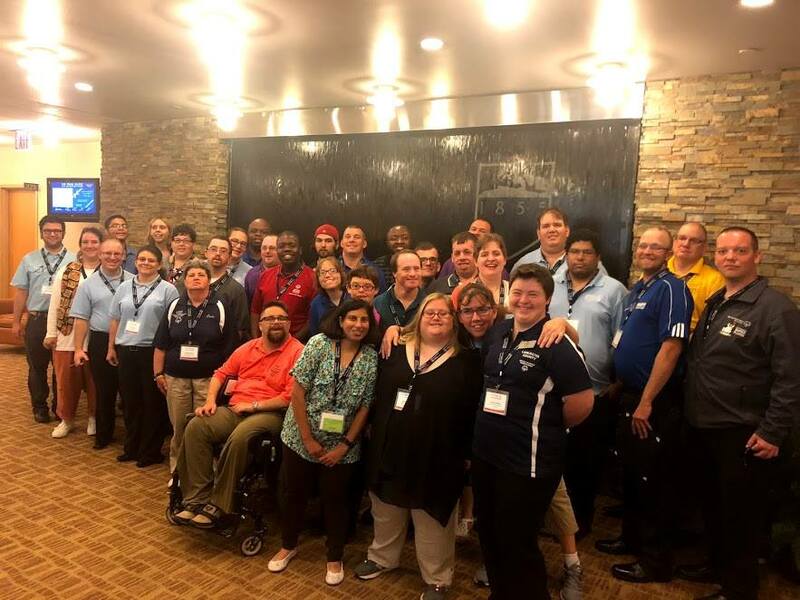 Through organized training and practical experiences, Athlete Leadership prepare athletes for meaningful positions of influence and leadership throughout the Special Olympics organization, both on and off the playing field. Athlete Leadership One Pager For Volunteers: Overview of Athlete Leadership courses based on the University model which are taken around a major in communications, governance, sports and/or health. In addition, reviews roles athletes can purse following completion of Athlete Leadership University. Handbook For Athlete Leaders: Outlines purpose of Athlete Leadership and includes detailed overview of Athlete Leadership University. Athletes with the proper training and coaching can lead us into the future. Athlete Leaders within all levels of our program have strong voices, a desire to get involved, and a better understanding of what their needs are and where we should be heading as an organization. ATHLETE LEADERSHIP UNIVERSITY- Training offered to Athlete Leaders three times a year to further their knowledge base and provide certification in the below. 3. Health – Health and Fitness Coordinators (trained to incorporate better health and fitness habits into their local program). 4. Sports – Coaches (trained to help athletes that currently are, or want to become certified coaches, make the transition from a competitor to a coach). ATHLETE INPUT COUNCILS - An open forum for Athletes to share their input on key topics, games and events. ATHLETE CONGRESS - Hosted every 2 years, is a forum for Athlete Representatives to present recommendations to the SOPA Board of Directors for organizational change. Athlete Congress attendees must be trained Athlete Representatives -- one participant per county. The 2020 Athlete Congress Chair is Kristine Progin from Lebanon County. ATHLETE LEADERSHIP TEAMS - Teams of athletes serving as part of a local program management team, providing direct athlete input. ATHLETES ON SOPA BOARD OF DIRECTORS - Positions are currently held by Ernie Roundtree from Monroe County and Johanna Schoeneck from Lycoming County. For more information and details on upcoming programs, please contact: Jordan Schubert, Athlete Leadership Coordinator. Athlete Feedback is very important to us. If you have any suggestions on how to make Special Olympics better for all athletes, please click the below button and submit your ideas.